It’s the story of the greatest basketball team you’ve never heard about. They broke boundaries and blazed trails, but were forgotten. Day Six of Black History Week. 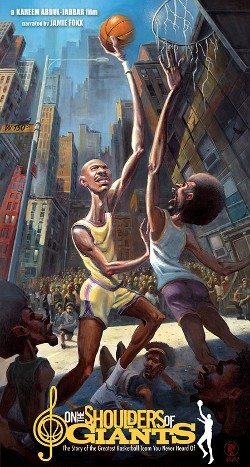 Poster courtesy of Kareem Abdul-Jabbar's website. It’s surreal to discover tiny pockets of history you never even considered before. Every child in school learns about the tribulations of Jackie Robinson, but I never learned anything about how professional basketball was segregated until the 1950’s. It’s one of those things that’s thrown me for a loop, even though it makes perfect sense, simply because I’d never considered it before. Black players are so intrinsic to basketball that the idea that they were once barred from mainstream play seems absurd. Within this gap in popular knowledge lives a great team: the Harlem Renaissance. Kareem Abdul-Jabbar produced On the Shoulders of Giants to illuminate this dark patch of memory. Bob Douglas established the Renaissance, or the Rens, in the early 1920’s as entertainment for the Renaissance Casino and Ballroom in Harlem. In the midst of the creative explosion from African-American artists in that area and time emerged a different kind of breakthrough. Under Douglas’ leadership, the Rens became a powerful force on the court. They developed a rivalry with the Original Celtics, eventually beating them to become World Champions. They won 88 consecutive games in a season, a record that still goes unbroken. They won the very first professional basketball tournament. They were so good that even a sports ignoramus such as myself can recognize it. And yet I never heard of them until today. You might be able to figure out why no one remembers the Rens. They’ve been eclipsed in pop culture by the Harlem Globetrotters. Which is ridiculous, since the Globetrotters aren’t even from Harlem! Just as black music and dance were often reconfigured for mainstream audiences, the Globetrotters were black team specifically designed to be palatable for white sports fans. The players’ infamous theatrical antics on the court have their roots in minstrelsy. They were a safe, acceptable piece of artifice that would entertain without ever threatening white security. In contrast, the Rens would face constant adversity as they went barnstorming across the country. The title of On the Shoulders of Giants refers to an Isaac Newton quote about how scientific discoveries come about by building on the work of those who come before. The same rule applies to social progress. The Rens were a great team and constantly pushed against the barriers of society, but since they never outright broke those barriers, they were condemned to obscurity after they disbanded. But that doesn’t make them any less important. Now their story is forever preserved on film, which is a little heartening. I don’t have much to say about this doc. It’s just a very nice movie, although I might be less positively disposed towards it if it weren’t teaching me something I didn’t already know. Aesthetically, the film is mostly functional and not artistic, although it makes nifty use of motion paintings to depict certain scenes as interviewees recollect them. The movie has a very simple, straightforward purpose, and it fulfills that purpose handily. It probably fits the bill of “Black History Month material” better than any other doc I’ve watched this week, being terrifically educational and all. It works even if you’re a non-sports fan, since it concentrates on social issues and not the game itself, although a few jargon-heavy moments made me temporarily blank out. It’s a completely adequate documentary, in the best way possible.